Golfing for a great cause! 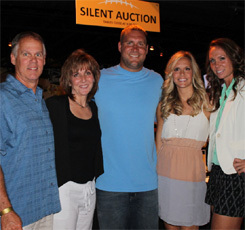 Grab your clubs and three golfing buddies and meet Ben, his friends and teammates on the golf course at the Sewickley Heights Golf Club on June 3rd for the Second Annual Ben Roethlisberger Foundation Invitational! 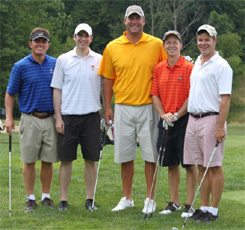 The tournament will benefit both the Make-A-Wish Foundation and the Ben Roethlisberger Foundation. Since 2007, the Ben Roethlisberger Foundation has made 107 grants totaling more than $950,000 to 102 police and fire departments and five community youth organizations, including Ronald McDonald House Charities and the Make A Wish Foundation. These 102 canine grants have funded the purchase of 66 dogs, the training of 28 dogs and 50 handlers, safety equipment for more than 50 dogs, and training equipment for 31 dogs, as well as food, vet services and housing for countless more. “The Montgomery County (MD) Sheriffs Office wanted to again thank Ben Roethlisberger and BigBen7.com for the support you have shown our office in the past. Last year we were able to purchase ballistic vests for all of our K9s because of your support.” – Deputy Sheriff James Johnson, Montgomery County Sheriff’s Office. A total of 112 golfers participated in last year’s tournament with 27 companies and corporations sponsoring the event, including Apollo Jets, Patriot Homes Corporation, University of Pittsburgh Medical Center, PNC, #1 Cochran, and the Pittsburgh Steelers. The golfers and their host had a great time with the pre-tournament competitions, which included the Chip Shot Challenge, a Super Bowl XLIII Challenge (throwing the football through the hands of a cardboard Santonio Holmes), Shuffleboard Golf, a “Big Shot” Challenge (driving your way through the AFC North), a $5,000 Putt Challenge, and a $1 million dollar Shootout (165 yard shot). During the tournament, golfers had the opportunity to try their hand at other competitions along the course, including Poker & Roulette Golf, a Men’s and Women’s Long Drive, the Straight Drive, a “Coffin Corner” on the 9th hole, and a TPC Sawgrass “Island Green” hole on the 17th. Space is limited for the tournament, so make your golfing plans now! You can sign up for the tournament (foursomes only – no single golfers), or learn more about it here. You can see an album full of photos from last year’s Invitational here. Is dining and dancing more your style? Well then, you can do both while still supporting The Ben Roethlisberger Foundation at Ben’s Second Annual Fundraiser the evening before the tournament on June 2nd, at Jergel’s Rhythm Grille in Warrendale, PA. Proceeds from the event will benefit K-9 Police and Fire Units throughout the country, and Make-A-Wish®. This fantastic evening will feature a strolling dinner, a live and silent auction, and the music of The American Flyers show band, which will have you dancing in no time! A few of Ben’s teammates, including Brett Keisel, Heath Miller, James Harrison, and Charlie Batch stopped by to show their support last year, as did ESPN’s Merril Hoge. You never know who will show up this year! The event is being sponsored with the help of Chrislynn Energy Services and Broadway Collision! “He brings a unique perspective because he grants wishes and he is good at that. He gets to make the wish happen. Now with the partnership with his foundation, he is taking it to the next level to allow other wishes to be granted. It’s an amazing thing.” — Leigh Ann Lubarsky, Manager of Program Services for Make-A-Wish, talking about Ben’s impact on the children. *Must be 21 years of age or older to attend! You won’t want to miss it so purchase your tickets now! You can see more photos from last year’s event here (bottom of first page to the second page). If you unable to attend either event, but would like to make a donation, click here. *Thank you to Jessica Duffaut at the Giving Back Fund, Justin Aquilante at ProServ Events, Sheila Weiner, The Event Group, Dan Jergel, and Teresa Varley, Steelers.com!